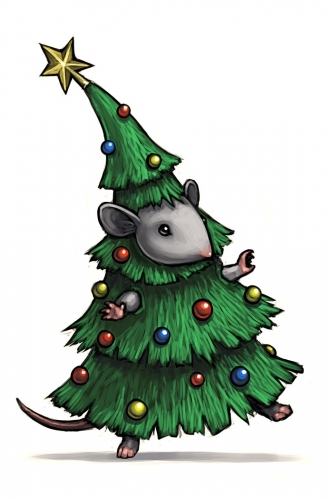 The Christmas Tree Mouse is an Event Mouse found during the annual Great Winter Hunt event. Information on how to locate and capture the Christmas Tree Mouse can be found on the current Great Winter Hunt location page. 3 December 2009: The Christmas Tree Mouse was released for the first time as part of the Great Winter Hunt '09 event and dropped Icing Sugar as loot. 12 December 2009: The Christmas Tree Mouse began to drop both Gingerbread Base Blueprints and Gingerbread House Plans in the Festive Comet. 14 December 2009: The Christmas Tree Mouse began to drop Three Santa Hats in the Festive Comet. 22 December 2009: The Christmas Tree Mouse began to drop Eleven Coloured Lights in the Festive Comet. 23 December 2009: The Christmas Tree Mouse began to drop Twelve Liters of Egg Nog in the Festive Comet. 2 January 2010: The Christmas Tree Mouse was released into the Harbour for a period of time to make up for a glitch and give players a chance at another set of Gingerbread Base Blueprints or Gingerbread House Plans. The glitch prevented players from collecting a second set of Gingerbread Base Blueprints or Gingerbread House Plans after failing to craft the item. It also dropped Frozen Fromage. 13 December 2016: The points/gold for Christmas Tree Mouse were changed.